Sharing goes hand in hand with the whole idea of breaking bread, does it not? Sit with people and break bread. Share what you have, eat and be merry together. I guess you could almost akin it to a pot luck, right? Yeah…. that’s it, a pot luck dinner. So the next time you get invited to a pot luck…. bring this dutch oven bread. Heck, it’s so easy, you could bring TWO loaves!! Everyone would admire the bread and “mmmm” and “aaaawww” over it. If there was a prize for Best Pot Luck Dish, you’d win it. And you wouldn’t have to tell them that you were napping or experimenting with the latest riff’s on margarita making while it was being made. Let them think you were kneading your knuckles raw. Wear band-aids to the pot luck for added admiration. Ok, Sounds good Joanne, but what ingredients do I need to make this fancy Dutch Oven Bread? Crazy right??? Nothing fancy here, just good old basic bread ingredients. I used all purpose flour for this recipe and your standard packet of quick rising yeast. 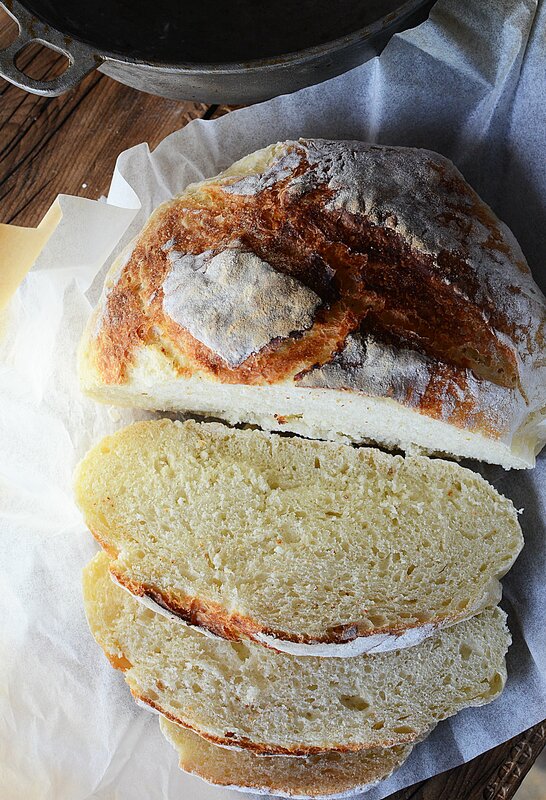 How do you make this awesome No Knead Bread?? So let’s get on with it. 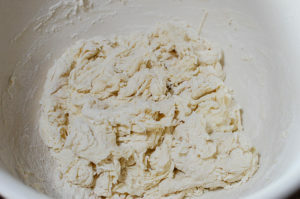 Put the flour, yeast, and salt in a bowl. Mix it up well. Add the warm water. Mix again. Cover with plastic wrap and put it somewhere cozy like the top of your stove, above the fridge, in the tub with you. ……… Ok, forget the tub thing, but you get the idea. Tuck it in for four hours and leave it. Go paint your nails. Go paint your deck. Make the margaritas (and invite me over). Then, four hours later, throw some flour on your counter and dump out the dough. Use a scraper or super floured hands and throw it around a bit. Fold it in on itself once or twice. Flip it over. Take the outer sides and pinch it into the middle like a dumpling. Poke it. Whisper sweet things to it. Tell it how much you love it…. haha, that might be too much, but really, the point is to just squish it down a bit and get it floured on both sides. Grab a piece of parchment paper and lay the dough on it, and cover it with a nice clean towel for 30 min. While it’s resting, preheat your oven to 425. If you have a dutch oven to bake it in, use that. If you have a clay baker, use that. If you have a cast iron pot with a lid, use that. Simply saying, use anything that can roast something at a high heat WITH A LID. Put it in the oven with the lid (make sure the knob is NOT plastic) and let it preheat with the oven. After 30 minutes and the oven is at temp, remove the cover on the dough, take a sharp knife and cut 2 -3 slashes in the top. Then, take the lid off the pot and drop the whole caboodle in… parchment paper and all. The parchment will not burn (as long as you didn’t confuse the situation and use wax paper. No wax paper please.). So right, just grab the dough by the corners of the parchment paper and drop it in the pot. Put the lid on and set the timer for 30 minutes. After 30 minutes, take the lid off and splash half a cup of water in the oven (yes, I know.). The half cup of water creates steam which helps form the crust on the top. Don’t worry it’s just water, and it totally evaporates. Plus it’s kinda fun to do! Leave in the oven another 15 – 20 minutes or until the crust is nice and brown. Take it out and let it cool. That’s it!! After it’s cool, you lift it right out of the pan by the parchment and transfer it to a cutting board. TRY YOUR HARDEST to wait until it’s completely cooled. The bread will thank you for it. Trust me. (Cutting hot bread = squished flat loaf). Slather it with butter. In fact, remember that Homemade Butter recipe I did? You could actually make that butter in the time that the bread was baking!! The combination of freshly baked bread with homemade butter? It’s a culinary masterpiece, for real. There’s NOTHING like it! You won’t be sorry if you try making this dutch oven bread. 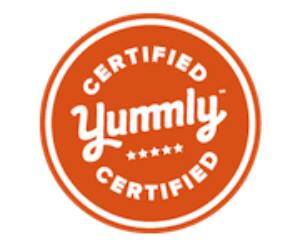 The experience and gratification of making your own bread is amazing and well … the taste is something out of this world!! Use a flour that is strong. 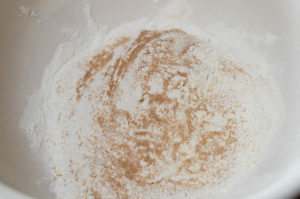 Cake flour doesn’t have a strong (or enough) gluten in it to form a nice crumb for the bread. You can mix your bread flours, all-purpose with a bit of whole wheat or even rye, but use a ratio of 1:4. The harder flours will make the bread denser and you don’t want to bake a brick. PLEASE wait until the bread has almost completely cooled to cut it. If you don’t it will seriously crush or smoosh the bread down and no one likes smooshed bread. Ok, so that’s about it! 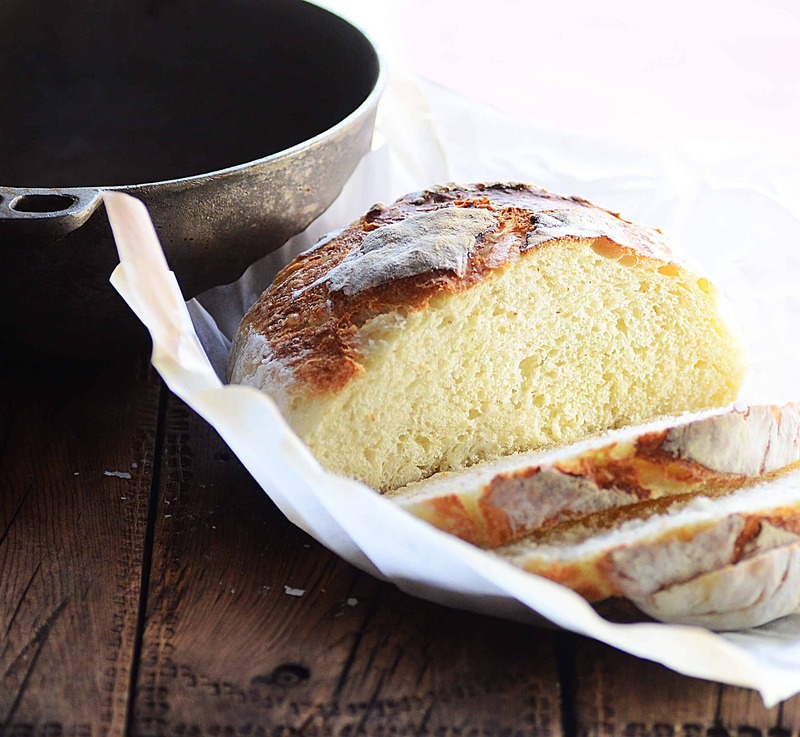 I hope you giving this Dutch Oven Bread recipe a go! It’s really so easy, and I hope you enjoy the final product! If you do, please take a photo and email me or hashtag TheSaltyPot on Instagram. I’d LOVE to see your final product!! Thanks so much for stopping by The Salty Pot today! This no-knead Dutch Oven Bread is one of the easiest and tastiest loaves of bread I've ever made!!! The crispy top, the soft inside, and that FLAVOR is not mistakingly HOMEMADE!!!! 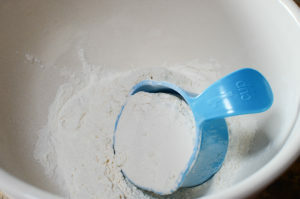 In a big bowl, combine flour, yeast salt and warm water. After 4 hours, transfer to well floured counter top. Bring the sides of the dough into the center. Pinch them together. Flip over and give it a squish. Cover with a clean light towel for 30 minutes. Meanwhile, preheat the oven to 425, and preheat the baking pot in the oven at the same time. 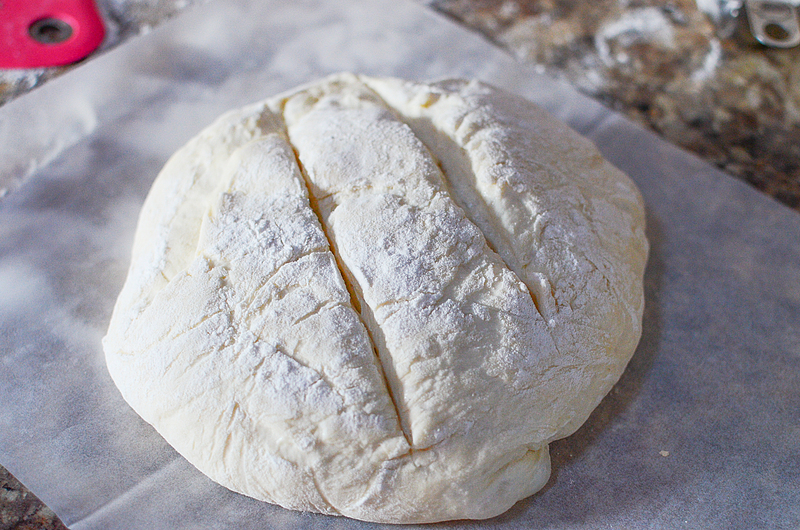 When the oven reaches temperature, lift the cloth off the dough and make 2 - 3 shallow cuts in the top of the dough. Take the lid off the pot in the oven, and place the dough in the baking pot, parchment paper and all. Replace the lid. Bake for 30 minutes. After 30 minutes, remove the lid and splash 1/2 cup of water on the inside of the oven to create steam. Bake for another 15 - 20 minutes or until the bread is golden brown. Remove from oven, let cool slightly and remove the bread by grabbing the parchment paper out of the pot. Let cool completely. Thank you for posting this. I have made bread for over 30 years off and on, but have made less in recent years due to painful knuckles so rely on a bread hook to knead my dough. I really did not think this recipe would work as we are told it’s the kneading that develops the gluten and that’s what makes the bread rise. However I’m always ready to try anything once! It does make a very wet dough, but rises beautifully (I added a little sugar to aid rise). I cut my dough in half and baked one as you suggested and one I put to rise in a bread tin. I baked both together in the oven and found no discernable differnce in outcome (ie one baked with a lid on and one without). My husband got really excited about this bread, it’s probably the first time he’s been at home when I’ve baked – newly retired! He was a little concerned about throwing water into an electric oven!!! I’ve since started adding ingredients to the basic recipe, Yesterday I made a walnut bread and it was delicious. Soon I shall have a new career as an artisan bread maker!